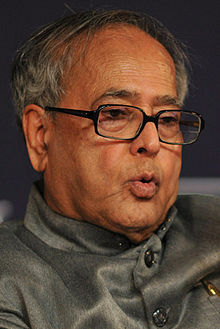 Pranab Kumar Mukherjee born 11 December 1935) is the 13th and current President of India, in office since July 2012. In a political career spanning six decades, Mukherjee was a senior leader of the Indian National Congress and occupied several ministerial portfolios in the Government of India. Prior to his election as President, Mukherjee was Union Finance Minister from 2009 to 2012, and the Congress party's top troubleshooter. Mukherjee got his break in politics in 1969 when Prime Minister Indira Gandhi helped him get elected to the Rajya Sabha, the upper house of India's Parliament, on a Congress ticket. Following a meteoric rise, he became one of Indira Gandhi's most trusted lieutenants, and a minister in her cabinet by 1973. During the controversial Internal Emergency of 1975–77, he was accused (like several other Congress leaders) of committing gross excesses. Mukherjee's service in a number of ministerial capacities culminated in his first stint as Finance Minister in 1982–84. Mukherjee was also Leader of the House in the Rajya Sabha from 1980 to 1985. Mukherjee was sidelined from the Congress during the premiership of Rajiv Gandhi, Indira's son. Mukherjee had viewed himself, and not the inexperienced Rajiv, as the rightful successor to Indira following her assassination in 1984. Mukherjee lost out in the ensuing power struggle. He formed his own party, the Rashtriya Samajwadi Congress, which merged with the Congress in 1989 after reaching a compromise with Rajiv Gandhi. Mukherjee's political career revived when Prime Minister P. V. Narasimha Rao appointed him Planning Commission head in 1991 and Foreign Minister in 1995. Following this, as elder statesman of the Congress, Mukherjee was the principal architect of Sonia Gandhi's ascension to the party's presidency in 1998. Mukherjee was born to a Bengali family at village Mirati in Birbhum district in the Bengal province of British India (now in West Bengal). His father, Kamada Kinkar Mukherjee, was active in the Indian independence movement and was a member of West Bengal Legislative Council between 1952 and 1964 as a representative of the Indian National Congress. His mother was Rajlakshmi Mukherjee. Mukherjee attended the Suri Vidyasagar College in Suri (Birbhum), then affiliated with the University of Calcutta. He has a Master of Arts degree in Political Science and History, as well as a degree in law from the University of Calcutta. Mukherjee's political career began in 1969, when he managed the successful Midnapore-constituency by-election campaign of independent candidate V. K. Krishna Menon. Prime Minister of India Indira Gandhi recognised Mukherjee's talents and inducted him in her party, the Indian National Congress. Gandhi gave Mukherjee a seat in the Rajya Sabha (the upper house of Indian parliament) from the Congress party in July 1969. Mukherjee would be re-elected to the house in 1975, 1981, 1993 and 1999. Mukherjee quickly became a staunch Indira Gandhi loyalist, and is often described as her "man for all seasons".] Mukherjee's rise was meteoric in the early phase of his career and he was appointed Union Deputy Minister of Industrial Development in Indira Gandhi's cabinet in 1973. Mukherjee was active in the Indian cabinet during the controversial Internal Emergency 0f 1975–77. Ruling Congress politicians of the day including Mukherjee were accused of using extra-constitutional powers to "wreck established norms and rules of governance". Following the Congress's defeat in the 1977 general elections, the newly formed Janata government-appointed Shah Commission indicted Mukherjee; however, the commission was itself later indicted for stepping "outside its jurisdiction" in 1979. Mukherjee emerged unscathed and rose through a series of cabinet posts to become Finance Minister from 1982 to 1984. His term was noted for his work in improving the finances of the government that enabled Indira Gandhi to score a political point returning the last installment of India's first IMF loan. As Finance Minister, Pranab Mukherjee signed the letter appointing Dr. Manmohan Singh as Governor of the Reserve Bank of India. Indira Gandhi made Mukherjee the Deputy Leader of the Congress in the Rajya Sabha in 1978. He was made Leader of the House in the Rajya Sabha in 1980. Mukherjee was considered the top ranking Indian cabinet minister and he even presided over the cabinet meetings in the absence of Prime Minister Indira Gandhi. Mukherjee was sidelined from the Congress during the Rajiv Gandhi era. It was suggested that he "was not forgiven for suggesting in a way after the assassination of Indira Gandhi that he was the most qualified and the next in line to succeed her." Mukherjee was subsequently marginalised in the party; losing his Cabinet berth and being demoted to take over the regional Bengal Pradesh Congress Committee. It was speculated that a new generation of Congress leaders close to Rajiv Gandhi were "responsible for most of what was happening to [Mukherjee]." "[The] group had emerged as the new power brokers in the party and the Indira loyalists were no longer seen as needed." Mukherjee quit the Indian National Congress in 1986. He floated the Rashtriya Samajwadi Congress (RSC) in West Bengal which he would merge with the Indian National Congress three years later after reaching a compromise with Rajiv Gandhi. The RSC had fared terribly in the 1987 Assembly polls in West Bengal. Many analysts, over the years, have attributed the muting of Mukherjee's political aspirations as the supreme leader due to his inability to emerge as a magnetic mass leader. On later being asked that did he ever desire to become Prime Minister, Mukherjee, however, replied, "7 RCR was never my destination."] The Zee News noted: "The statement assumes heft in the light of the longstanding speculation that Mukherjee, as one of the doyens of Congress, always nursed an ambition to occupy the top executive post." Mukherjee's political career revived following the assassination of Rajiv Gandhi in 1991 when P. V. Narasimha Rao chose to appoint him as deputy chairman of the Indian planning commission and subsequently as a union cabinet minister. Mukherjee served as External Affairs Minister for the first time from 1995 to 1996 in Rao's cabinet. Mukherjee became Leader of the House in the Lok Sabha in 2004 He contested and won a Lok Sabha seat from Jangipur in West Bengal which he would later retain in 2009. It was speculated in 2004 that Mukherjee would be made Prime Minister of India after Sonia Gandhi unexpectedly declined the position. However, Gandhi eventually nominated Manmohan Singh to become Prime Minister. Mukherjee was briefly considered for the post of the largely ceremonial Indian presidency in 2007. But his name was subsequently dropped after his contribution in the Union Cabinet was considered practically indispensable. Regardless, the India Today went on to opine that Mukherjee should be made President. The magazine wrote: "[It] would please the many who see Mukherjee as the best prime minister India never had. It would also lay the ghosts of the past and confirm a confident Congress leadership's ability to acknowledge its debt to the man in whom Indira Gandhi placed her trust." Mukherjee held many important posts in the Manmohan Singh government. He had the distinction of being the Minister for various high profile Ministries including Defence, Finance, and External Affairs. Mukherjee also headed the Congress Parliamentary Party and the Congress Legislative Party which consists of all the Congress MPs and MLAs in the country apart from being Leader of the House in Lok Sabha and Bengal Pradesh Congress Committee President. Mukherjee is "very well respected within the party social circles." Media accounts describe him as having "a reputation as a number-crunching politician with a phenomenal memory and an unerring survival instinct." India Today wrote that Mukherjee's rôle in "skillfully pushing through the historic 123 Agreement and treaty with the Nuclear Suppliers Group" may have saved UPA-II government from the 2008 motion of no confidence. Mukherjee played a crucial rôle in steering the Cabinet pre Lok Sabha elections when Prime Minister Manmohan Singh underwent a by-pass surgery in 2008–09 by taking additional charges as chairman of the Cabinet Committee of Political Affairs and Union Minister in Finance Ministry despite already being Union Minister of External Affairs. Mukherjee was the recipent of “The Best Administrator in India” award in 2011. Prime Minister Manmohan Singh commented: "Mr. Mukherjee's knowledge of parliamentary matters was stupendous. The wide respect he commanded and his long association with the political leaders across the spectrum had proved invaluable in conducting the parliamentary business." Dr. Manmohan Singh appointed Mukherjee as the Minister of Defence of India when the Congress came to power in 2004. Mukherjee held the post until 2006. He expanded co-operation with the United States during his tenure. The Times of India reported on the Wikileaks cables release and noted how " [United States] is full of praise for the "uniformed leadership" of Indian armed forces, especially Navy, as well as ministers like Mukherjee." Mukherjee in June 2005 had inked the 10-year Indo-US Defence Framework deal. Mukherjee's second term began in 2006. He oversaw the successful signing of the U.S.-India Civil Nuclear Agreement with the US government and then with the Nuclear Suppliers Group, allowing India to participate in civilian nuclear trade in spite of not having signed the Nuclear Non-Proliferation Treaty. Mukherjee played a crucial rôle in mobilising world opinion against Pakistan after the 2008 Mumbai attacks. He left the position a year later to take over the Finance Ministry of India. Mukherjee was nominated as the presidential candidate of the United Progressive Alliance on 15 June 2012 after considerable political intrigue. The elections were scheduled to be conducted on 19 July 2012 and the results were expected to be announced on 22 July 2012. As many as 81 other candidates had filed nominations but the Election Commission rejected all except that of P. A. Sangma, the nominee of the National Democratic Alliance (NDA). In order to file his nomination for the presidential poll on 28 June, Mukherjee had resigned from the government on 26 June 2012. Mukherjee was sworn-in by the Chief Justice of India on 25 July 2012, becoming the first Bengali to hold the post of President of India.After being administered the oath of office, he said we are amidist of fourth world war of terror and what minutes of peace can achieve cannot be achieved in many years of war. Congress President Sonia Gandhi and Prime Minister Manmohan Singh both congratulated Pranab Mukherjee on his election as President.Former Communist leader Somnath Chatterjee termed Mukherjee as one of "the best parliamentarians and statesmen of India" and said the country "has got the most able man for the top job". Opposition leader Sharad Yadav declared "the nation needed a president like Pranab Mukherjee. "Delhi Chief Minister Sheila Dikshit commented and said Mukherjee will be "one of the wisest presidents." She further marvelled at the fact that parties in the opposition ranks supported Mukherjee. "Even the NDA broke up and wanted to vote for the president to be Pranab Mukherjee." The Bharatiya Janata Party (BJP) was reportedly "shocked" and "upset" at the cross-voting for Mukherjee by its legislative members. However, the BJP party President Nitin Gadkari congratulated Mukherjee and said "I extend my hearty congratulations to Pranab Mukherjee on his election today as the new President of India." Gadkari further declared "I am sure that the country will make further development and progress. I wish him all success and a bright future." The Zee News noted: "What is striking about [Mukherjee] is that after more than four decades in public life, the Opposition had no ammunition against him after he was declared UPA’s choice for President. Inspite of Team Anna making some noise about him being involved in some corruption cases, it has been more or less an easy ride for Pranab to Raisina Hill. Once when Sonia Gandhi announced his name, most of the allies and the Opposition came on board. Whereas, NDA partner JD(U) saw no merit in opposing him, one of the bitter critics of the Congress Shiv Sena too toed the line a little too easily. This support was not for Congress but for [Mukherjee]". Pranab Mukherjee married Suvra Mukherjee on 13 July 1957. Suvra Mukherjee was born and raised in Narail, Bangladesh. She immigrated to Kolkata while she was 10 and married to Pranab in 1957 .The couple have two sons and a daughter. He is inspired by Deng Xiaoping and has quoted him quite frequently. His hobbies are reading, gardening and music.] His elder son, Abhijit Mukherjee, is a Congress MP from Jangipur, West Bengal. He was elected in the by-polls held after his father vacated the seat.Before his election, Abhijit was an MLA from Nalhati in Birbhum. His daughter is a Kathak dancer. Becoming presidential candidate can have its price. For Pranab Mukherjee, it comes in the shape of an honorary doctorate from India’s first IIT. The government has dropped Mukherjee’s name from a list of five candidates, forwarded by IIT Kharagpur for honorary Doctorate of Science (DSc) degrees, on the ground that conferring a central institute’s award on the ruling alliance’s presidential candidate may not be proper. Besides, the degrees are to be awarded on August 25, by when the next President — in all likelihood Mukherjee —will have assumed office. Mukherjee may not rue his loss too much — he already has one honorary doctorate, a DLitt awarded by Assam University, Silchar, in March. An IIT Kharagpur source said the honorary DSc would have been recognition for Mukherjee’s “generosity” towards the institute during his stint as Union finance minister. The institute was allocated Rs 200 crore in last year’s budget for development projects. Besides, before leaving the ministry, Mukherjee gave “positive indications” about the tech school’s demand for Rs 150 crore to set up a 400-bed hospital so that it can start a course in medicine. IIT Kharagpur’s senate, which chooses the recipients of honorary degrees, had proposed the five names on May 30. By the time its board of governors ratified it on June 18, however, Mukherjee had been nominated for President. , IIT Kharagpur director Damodar Acharya sent the names to the Union human resource development ministry to get them approved by the President, who is the institute’s Visitor. “The ministry felt it would not be appropriate to send up Mukherjee’s name for approval. The other names have been forwarded,” a ministry official told The Telegraph. The others on the list include industrialist Baba Kalyani, former IIT Kharagpur chairman B. Muthuraman, and IIT Madras chairman M.M. Sharma. Some IIT Kharagpur teachers are unhappy that the names were passed at the senate without discussion although they had no objection to the choice of Mukherjee. A faculty member said the institute director had not placed the matter on the May 30 meeting’s agenda and simply announced the names at the end. Congress president Sonia Gandhi along with Prime Minister Manmohan Singh on Tuesday congratulated Pranab Mukherjee on his election as India's 13th president. The Prime Minister was accompanied by his wife Gursharan Kaur who reached Pranab Mukherjee's 13 Talkatora Road residence to greet him immediately after his big win. Sonia Gandhi and her son and party general secretary Rahul Gandhi also reached Pranab's residence to congratulate him. Fight against terrorism is the fourth world war and India has been on the frontlines of this, President Pranab Mukherjee on Wednesday said while hailing the valour and conviction of the Indian Armed Forces. Taking oath as the President, he said a few minutes of peace will achieve far more than many years of war. ”...But the visible rewards of peace have also obscured the fact that the age of war is not over. We are in the midst of a fourth world war; the third was the Cold War, but it was very warm in Asia, Africa and Latin America till it ended in the 1990s,” said the President, who is also the Supreme Commander of the Armed Forces. The war against terrorism is the fourth; and it is a world war because it can raise its evil head anywhere in the world,” the President said in his acceptance speech in the Central Hall of Parliament. India has been on the frontlines of this war long before many other recognised its vicious depth or poisonous consequences, he said. “I am proud of the valour, conviction and steely determination of our armed forces as they have fought this menace on our borders; of our brave police forces as they have met the enemy within; and of our people, who have defeated the terrorist trap by remaining calm in the face of extraordinary provocation,” Mr Mukherjee said. Noting that the people of India have been “a beacon of maturity through the trauma of whiplash wounds”, he reminded those who instigate violence and perpetuate hatred that “few minutes of peace will achieve far more than many years of war”. “India is content with itself, and driven by the will to sit on the high table of prosperity. It will not be deflected in its mission by noxious practitioners of terror,” the President said. The President Pranab Mukherjee's son Abhijit on Saturday managed to retain the Jangipur lok sabha seat by a margin of just 2536 votes, which is the lowest victory margin in this Congress bastion. He had defeated CPIM's Muzaffar Hossen by a margin of just 2536 votes. While Abhijit got 332919 votes, CPIM's Hossen had managed to secure 330383 votes. This narrow margin has certainly worried the Congress leadership in West Bengal as well as the party leadership in Delhi as Jangipur falls under Murshidabad district which is still a Congress stronghold. All the three lok sabha seats of Jangipur, Berhampore and Murshidabad were won by the Congress in 2009 lok sabha elections. Jangipur fell vacant after Pranab Mukherjee quit the Lok Sabha to become the President of India. Pranab's son Abhijit took over the challenge of fighting the by-elections, but could not retain the victory margin his father had obtained in 2009, even though he managed to retain the seat. Interestingly, Trinamool Congress did not filed its candidate against Abhijit. But the party chief Mamata Banerjee did not spell out clearly whether she was supporting the Congress candidate. None of the Trinamool Congress leader had campaigned for Abhijit. It is certain the Congress leadership will analyse their performance in Jangipur and try to find out the factors responsible for Abhijit's poor show. Many in the state Congress circles here feel that Abhijit did not get a major chunk of Trinamool Congress votes which might be one of the key factors for his poor electoral performance. Jangipur had become a prestige issue for the All India Congress Committee (AICC) leaders. The AICC had deployed heavyweight leaders like party MP and circketer Md Azharuddin, Ghulam Nabi Azad and actor Raj Babbar to campaign for Abhijit. All the senior state Congress leaders like state party president Pradip Bhattacharjee, Manas Bhunia also camped at Jangipur before the elections and campaigned for their candidate. Still, the result was not very satisfactory for the Congress leadership in West Bengal as well as in Delhi. It was very important for the Congress to retain the Jangipur lok sabha seat. Not only because it was won twice by Pranab Mukherjee, but also for the fact that the Congress required to retain its strength in the Lok Sabha in view of Mamata Banerjee's threat to bring a no-confidence motion against the Centre. Interestingly, Jangipur lok sabha by-elections had taken place at a time when the Manmohan Singh government had announced important policy decisions about FDI and insurance sector. Mamata Banerjee had also snapped her ties with the Congress and all her ministers had resigned from the Union government. In a reaction to that, Congress ministers had also resigned from Mamata Banerjee's government in West Bengal. It is learnt that the state Congress leaders will also try to analyse whether their government's recent decisions were responsible for the poor show for their candidate in Jangipur by-elections.